In German we call Hosting the word “Gastgeben” is made out of two separate words: Gast = guest and Geben = give. The host therefore is the “Gastgeber”, the one who gives. I tend to prefer the German way of naming one of the core qualities of every culture, that is widely appreciated but rarely ends up to be awarded. Last year I wrote a late goodbye to my grandmother who left this world for good in 2014 already but still keeps my mind busy with her approach towards a good life. She was a strong personality and one that spent daily hours with her friends. Thus she ended up hosting her birthday still in her 70ties celebrating for 3 days to host all the people that wanted to celebrate her. She taught me that hosting is about giving not about about showing off. It’s about the guest feeling welcomed, spoiled and celebrated. This years Award L’Art de Vivre Preis für Große Gastlichkeit 2019 honored a young man, whom I had the chance to talk to during the competition. Self confident yet approachable, he let me know what matters to him, and that perfection might be one but not the only way to please a guest. 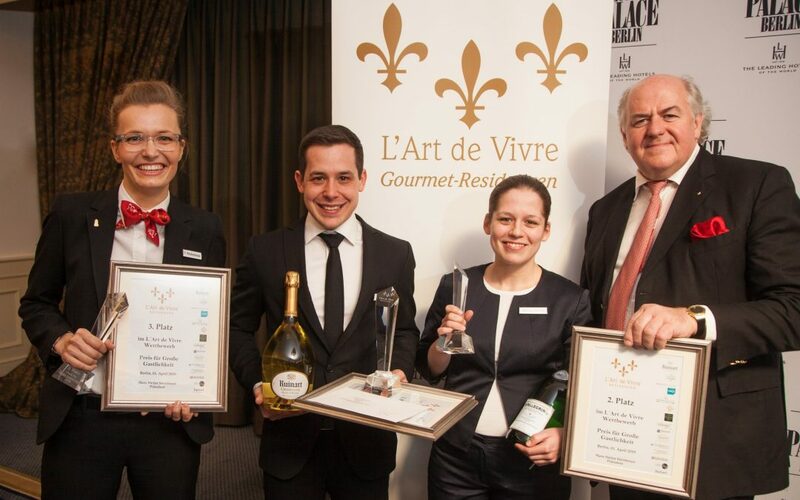 Congrats to Michael Jantscher and The Fontenay, Hamburg! Michael was awarded as the winner, followed by two young ladies who proved their hosting qualities as well.